A few small changes have made a big difference on the new Sony AS50 Action Cam. The first noticeable change the camera has a flat bottom (oh err!). The rounded bottom (ahem…) of the predecessor, the AS30, means that it cannot be easily rested on a flat surface. Most of the time the camera will be mounted to a support, but there are still times that just resting the camera on a wall or table to shoot a timelapse would be convienent, and thanks to the flat bottom of AS50, this is now possible. In use the new Sony AS50 Action Cam is also better than the AS30, largely thanks to better button placement on the side of the camera, and more intuitive operation. However, the shooting settings and features remain largely the same. The camera can record up to 1080p at 60fps, or 120fps at 720p. Three tally lights are now fitted to the front, top and rear of the camera so you can easily see if it is recording, from whichever angle you are viewing it. Inside the minimal, sleek, exterior, is a 1/2.3 type (0.3 in) back-illuminated “Exmor R” CMOS sensor that can shoot 11.1-million-pixel still images, at shutter speeds between 1/30th-1/10,000th sec. The lens is unchanged from the previous model, with a Zeiss Tessar f/2.8 18.4 mm (35 equivalent) focal length, or 21.8mm (35mm equivalent) when in its narrow setting. The minimum focus distance is 30cm. However, what really gives the Sony AS50 an advantage over GoPro cameras is the built-in SteadyShot stabilisation. This can make a huge difference to your footage, saving time, and image quality by not having perform heavy image stabilisation in post-processing. What is equally exciting as the camera itself are the accessories that will work with it. The first is the underwater housing. the new housing is included with the AS50 and it can be used at depths of up to an impressive 60m/197ft. The housing will also protect the camera from sand, dust, dirt as well taking the brunt of any knocks the camera may take. An optional acessory is the new wifi remote control unit. Anyone who used the previous watch style remote will have no doubt found it quite cumbersome, and a little uncomfortable to wear. The new design looks much more like a smartwatch, with a slimmer profile, and the small controller itself can be removed and used on a articulated thumb/finger mount. When used with the mount the AS50 Action Camera becomes a very neat, portable, camcorder. The mount is so simple in its design and implementation, but is very effective. As usual there is a number of different monts for mounting the camera to everything from a bike to a pair of ski goggles. 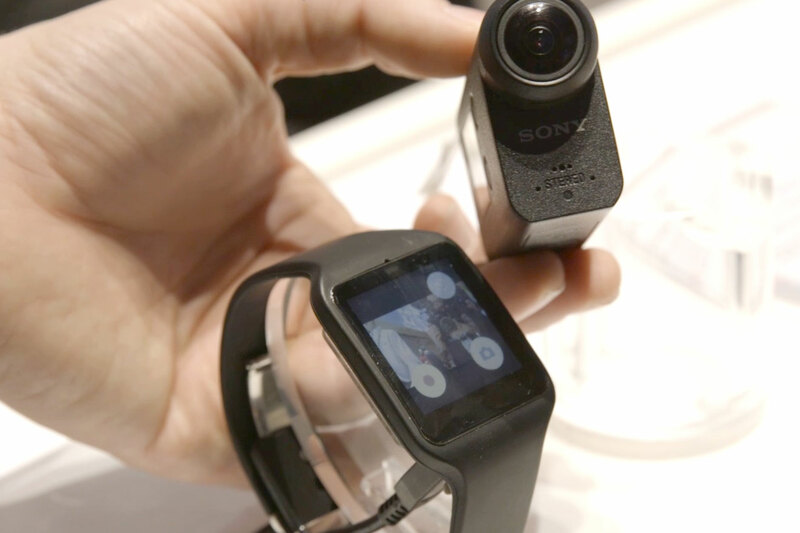 If you are a Sony smartwatch user you will be pleased to hear that Sony is currently testing a beta version of its remote controller app that will allow the action camera to controlled, with a live view, directly from the watch. The app is expected to be released about the same time that the AS50 is released, which will be around the middle of February.